This library, open to the public, holds superior classic Japanese and Chinese books centering on the former collection of the Owari Tokugawa family. The current collection consists of about 110,000 items and the library features the rich contents of these works. 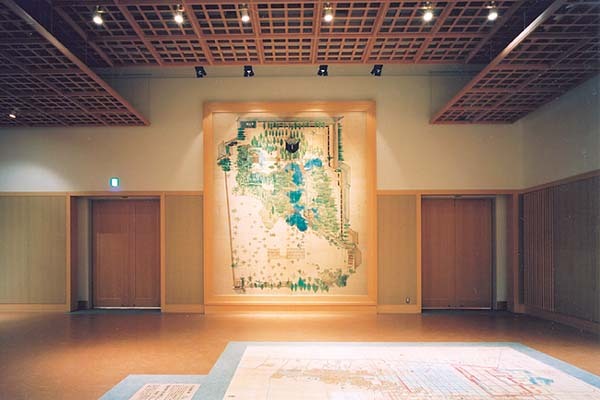 In addition to books, the Library keeps more than 2,000 pictorial images handed down in the Owari Tokugawa family, these range widely from old maps such as of the castle town of Nagoya to a world map as well as drawings of mansions,gardens, and others. Visitors can review the books in the collection and also enjoy exhibitions which introduce, in an easy-to-understand way, the samurai culture in the 17th-19th Centuries including its academic disciplines and the cultural accomplishments of the samurai class, together with articles once belonging to the feudal lords and now owned by the Tokugawa Art Museum. The Library also plans and holds lectures sponsored jointly with the Tokugawa Art Museum and the Tokugawaen. Origin of the Name "Hôsa"
Hosa was another name for Nagoya during the Edo Period (1603-1868). The Atsuta Shrine was said to correspond to the legendary Horai Island (Isle of the Immortals) and Nagoya was located on its left. Thus, it was called Hosa (left of Horai). The collection of books owned by the Owari Tokugawa family was named the "Hosa Library" around 1912 to indicate that the library preserved the books from the library of the Owari Clan from Nagoya Castle. When Ieyasu Tokugawa, founder of the Edo Shogunate, went into retirement he spent his last years at Sunpu Castle, and established the Suruga Library. After the demise of Ieyasu, the books in the library were divided and transferred to his sons in the Shogunate family and those in the three branch families of the Tokugawa family. These later came to be known as the Suruga-oyuzuri-bon. Yoshinao Tokugawa, Lord of the Owari Clan, which headed the three branch families, was given 3,000 books, including many superior works such as those in the collection formerly owned by the Kanazawa Library, and these came to constitute the core of the collection of the library of the Owari Clan.